Want to enjoy a vacation in the wilderness? Tadoba National Park promises to offer matchless beauty and excitement for all wildlife lovers. With Tadoba wildlife tour, you will be breathing in excitement and breathing out love. The tour is going to live forever in your memory. This national park is located in Maharashtra. It is fast becoming popular among international tourists because of the pristine beauty it possesses. Here, you will find a wide range of exotic flora and fauna species. The surroundings look so verdant that wildlife lovers will remain lost in the wonderful opulence of nature. Most trips to Tadoba are short stay. However, the best option is to book a 3 nights and 4 days tour package to explore the entire National Park along with the outskirts. Tadoba features a good collection of tigers. However, if you want to spot tigers, visit Tadoba during the summer season. The best time to spot tigers is during the months of April to June. Here, you will also find many rare species. Nagpur is a popular city in the state of Maharashtra. It is well-connected by road, air, and rail. Once you reach Nagpur, you need to hire a private vehicle to reach Tadoba, located at the Chandrapur District. Tadoba is approximately 140 km from Nagpur. Tadoba National Park is another 3 km from Tadoba Village. The total travel time is approximately 4 hours. It is one of the largest national parks in the country. The park promises strong presence of biodiversity and holds countless fauna and flora. You will find numerous rare wildlife species in this wildlife reserve. However, the primary attraction is tiger reserve. There are also wild bears, hyenas, jackals, barking deer, sambhar, cheetal, and nil gai. Tadoba Andhari Reserve is the largest national park in Maharashtra. Total area of the Reserve is 625.4 square kilometers (241.5 sq m). This includes Tadoba National Park, created in 1955 with an area of 116.55 square kilometers (45.00 sq m) and Andhari Wildlife Sanctuary created in 1986 with an area of 508.85 square kilometers (196.47 sq m). The Reserve also includes 32.51 square kilometers (12.55 sq m) Protected Forest and 14.93 square kilometers (5.76 sq m) ‘other areas’. Densely forested hills form the northern and western boundary of the Tiger Reserve. Tadoba lake which acts as a buffer between the park’s forest and the extensive farmland which extends up to Irai water reservoir. This lake is a perennial water source which offers good habitat for Muggar crocodiles to thrive. Other wetland areas within the reserve include the Kolsa lake and Andhari river. Once you reach Tadoba, there are plenty of quality accommodations available for staying purpose. 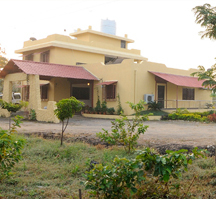 There are government resorts at Tadoba National Park. These resorts come with both lodging and fooding facilities. Enjoy the special tribal cuisine, which seems to be quite spicy. However, if you have a problem with spicy food, do inform them at the earliest to make the food suit your taste. The evening time is perfect for walking through the walkways available within the resort boundaries. After-dark hours may not be safe to walk a mile further away from the resort. Most of the resorts will serve dinner by 8pm. In fact, there is nothing specific to do at the night when you think of outdoor activities. The next day, you will probably be heading for the safari tour. The early morning safari tour is best. It starts at 6 a.m and ends at 10 a.m. The heat will also not be much high during this part of the day. Enjoy the wildness and get thrilled while observing the rarest of species walking or flying by your sight. Also, the early morning safari is best to catch glimpse of different species of birds. If you are a wildlife lover, this place will definitely cater to you. 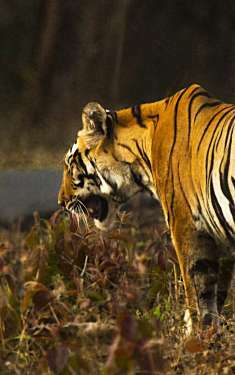 Tadoba is popular for its tiger reserve. If you visit the place during summer season (April to June), there is assurance of catching a glimpse of the ‘sher.’ However, during monsoon or cold seasons, most of the tigers don’t prefer coming out of the den. Winter is best season to enjoy the beauty of the wildlife reserve at Tadoba. Chandrapur Railway Station is the nearest railhead from the National Park as it is at the distance of 45 Km. Chandrapur railhead is well connected to other major cities like Delhi, Chennai, Hyderabad, Mumbai and Jhansi. Taxis and buses are available from railway station to reach the Tadoba Tiger Reserve.